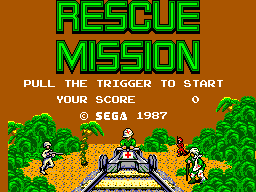 Rescue Mission is a shooting game developed and published by Sega for the Sega Master System. Using the Light Phaser peripheral, the player is required to shoot waves of enemy soldiers to protect a medic on a rail cart who slowly moves around the level rescuing injured friendly soldiers. There are three levels of difficulty to choose from, and no option to play without the Light Phaser. Main article: Rescue Mission/Magazine articles.